Abubakar said while he came out the top in a keenly contested exercise, such could not be said of Buhari. “We are not surprised that there is confusion in the President’s camp. We expected that they would be thrown into a catatonic state knowing that HE Atiku Abubabakr’s emergence automatically means the coming end of their ignominious reign,” he said. 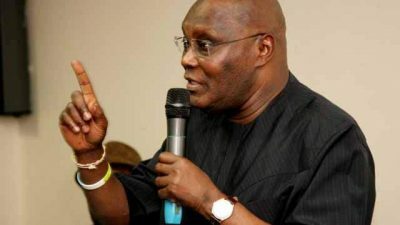 “That much was admitted by the President’s former running mate, Pastor Tunde Bakare when he praised the emergence of HE Atiku as an ‘Eagle’ and ‘a cosmopolitan wazobia’ politician. Obviously, Pastor Tunde Bakare has foreseen that the era of 97% versus 5% has come to an end with the emergence of the pan Nigerian Atiku Abubakar. “We ask how can the Buhari Campaign Organisation disparage the PDP Primary that produced His Excellency, Atiku Abubakar, when even the President’s own wife, Aisha Buhari, has condemned the APC’s primary? Not only did Mrs Buhari condemn APC’s primaries, but she also described them as ‘unfair’ and lacking in integrity. Who can know President Buhari better than his wife. Abubakar said various acts of corruption were being committed under the current administration, which he said caused Transparency International to classify the country as more corrupt now than it was three years ago. He said the choice before Nigerians was between a candidate who has provided over 50,000 jobs to people in his personal capacity and the other under whom 11 million Nigerians have lost their jobs. “No wonder Transparency International rated Nigeria as more corrupt today under Buhari than just three years ago when the PDP was in power,” he said. “The scandals are too numerous, including the $25 billion NNPC contracts awarded without due process, the several padded budgets, the $41 million Ikoyi Apartment scandal, the recall, reinstatement and double promotion of pension thief and Buhari financier, Abdulrasheed Maina, the N200 million grass cutter scandal, and many others too numerous to mention.